at Théâtre "Le Grand T", Nantes, Loire-Atlantique, France. Mixed and mastered by Maïkôl Seminatore at The Border Studio. Produced by David Chevallier & Stéphane Berland. Cover artwork by Bénédicte Gallois. The gathering of two open-minded instrumentists, a generation apart from one another. A second encounter made possible by the label, after having heard a first 'on-the-fly' recording, this one recorded over a full day and lovingly edited so you get the most of these two great musicians' improvised "fireworks". 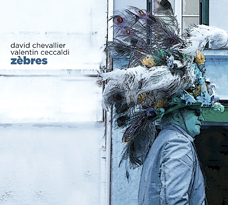 Ignoring any dogmatism, Valentin Ceccaldi and David Chevallier create ephemeral, unclassifiable musical pieces, sometimes rough, sometimes silky. Their imagination feeds on so many soundscapes that it can not be limited to a single style.